Cont. Lab. Plant Disease Sci. Fac. Agric. Gifu Univ.101 (1813). The Gloniaceae. A-E. Glonium stellatum (ANM 41 [ILLS], U.S.A.; not incl. ), arrows in 12B, subiculum. F-H. Glonium circumserpens (CBS 123343 [BPI 878739], Tasmania). 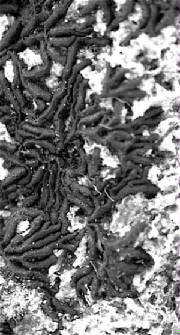 Scale bar (habitat) = 1 mm; Scale bar (spores and asci) = 10 μm. = Solenarium Spreng., Syst. veg. 4(1): 376, 414 (1827). = Psiloglonium Höhn., Annls. mycol. 16(1): 149 (1918). 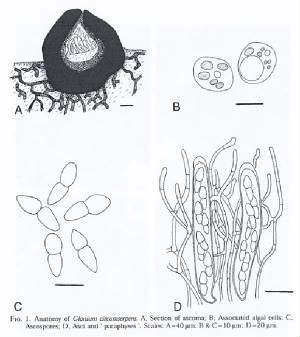 The genus Glonium is characterised by modified hysterothecia, progressively dichotomously branched, laterally anastomosed along their length to form radiating flabelliform or pseudo-stellate composites, usually seated upon a conspicuous brown felt-like subiculum, sometimes borne in a stroma (Zogg 1962). Hysterothecia in vertical section globose to obovoid, typically with a thick, three-layered peridium, but fragile, unlike the robust peridium of the Hysteriaceae. 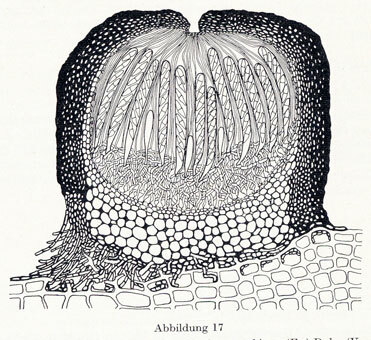 Luttrell (1953) described the development of the ascocarp in the type species, G. stellatum Muhl. as composed of small pseudoparenchymatous cells, the outer layer heavily encrusted with pigment and often longitudinally striate on the surface, the middle layer lighter in pigmentation and the inner layer distinctly thin-walled, pallid and compressed. 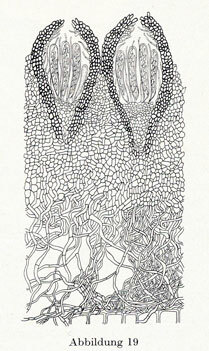 The hamathecium consisted of persistent narrow cellular pseudoparaphyses, often borne in a gel matrix, with tips darkened or branched at maturity. Bitunicate asci are borne in a basal layer and at maturity are typically clavate to cylindric, bearing eight ascospores, overlapping biseriate; ascospores ranging from hyaline to pale yellow, 1-septate, conspicuously constricted at the septum, fusoid in outline, with at least one end, often both, acuminate, and showing bipolar asymmetry. Zogg (1962) listed three species that he grouped together in his key, that later formed the basis for the Gloniaceae (Boehm et al. 2009). These are the type species, G. stellatum (Fig. 12A-E), G. graphicum (Fr.) Duby, and G. compactum Kern, the latter associated with both subicula and stroma. To these three species, we can add the recently described saxicolous, terricolous and lignicolous G. circumserpens (Nyl.) 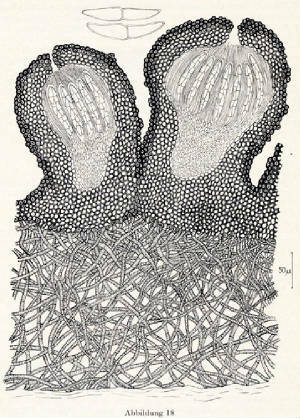 Kantvilas & Coppins (Fig. 12F-H) from Tasmania (Kantvilas & Coppins 1997). Although von Höhnel (1918) and Petrak (1923a) stressed the importance of subiculum as a synapomorphic character state, Zogg (1962) noted that G. graphicum may or may not be associated with a subiculum. 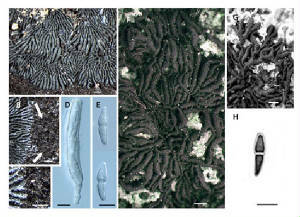 This, combined with the observation that P. lineare may also on occasion be associated with subiculum, led Zogg not to accept the genus Psiloglonium. Data presented here and elsewhere (Boehm et al. 2009), however, indicate that the synapomorphic character state is not subicula per se, but the ascomata, which are modified hysterothecia that are progressively dichotomously branched, to form radiating pseudo-stellate composites. This is most pronounced in G. stellatum and G. circumserpens, but may also be found to a lesser extent in G. graphicum (Zogg 1962). One distinguishing feature that separates G. stellatum from G. circumserpens is that, although both are associated with subicula, in the former this extends as a wide margin in front of the developing hysterothecia (Fig. 12 A-C), whereas in G. circumserpens (Fig. F-G) the subicula is only associated with the under surface of the hysterothecia, closely appressed to the substrate, with only minor deviations from the long axis of the fruitbody. In Boehm et al. (2009b) four isolates were surveyed for the Gloniaceae. Two of G. stellatum, from Michigan (CBS 207.34) and Tennessee (ANM 32), the United States, and two of G. circumserpens, recently isolated from wood (CBS 123342 / BPI 878738) and dolerite stone (CBS 123343 / BPI 878739) from Tasmania. Molecular data indicate that all four isolates are closely related. Surprisingly, this clade also includes multiple isolates of Cenococcum geophilum, an ecologically important ectomycorrhizal fungus with a global distribution and a wide host range, but with no known teleomorph (LoBuglio et al. 1996; see also Schoch et al. 2009c). Didymospores oblong to spindle-shaped; upper cell pear-shaped, constricted at septum; both ends acuminate, measuring (18-)21-26(-28) x (4-)5-6(-7) μm; cosmopolitan .→ Glonium stellatumMühl. Duby. 1862. Mem. Soc. Phys. et Hist. Nat. 16: 47. Rare, Old wood & bark of Pinus & Juniperus. Europe (Germany). Hysterothecium branched, irregular, “graphoid”; with or without a subiculum according to Zogg (1962). The acuminate didymospores oblong to spindle-shaped, clearly fusoid in outline, with the upper cell pear-shaped, and prominantly constricted at septum; both ends acuminate, measuring (13-)15-18(-21) x (3-)5-6 μm. Glonium graphicum (Fries) Duby. From Zogg (1962) pg. 59, 70. Fries, E. 1823. Syst. myc. II: 595. Quite rare. Collected from old wood of Quercus. North America. Glonium stellatum Mühl. From Zogg (1962) pgs. 59, 72. Kantvilas & Coppins. 1997. Lichenologist 29: 525. 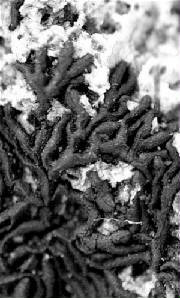 Kantvilas & Coppins (1997): “Ascomata lirelliform, mostly 1 – 3 (-4 – 5) mm long, 0.15 – 0.3 mm wide, 0.35 – 0.5 mm tall, black, often glossy, very brittle, superficial over the substratum (soil, rocks, lignum), simple, occasionally branched, straight or slightly curved, dispersed, crowded & sometimes overlapping or, most commonly, laterally contiguous in radiating, +/- stellate clusters up to 10 – 20 mm wide; lips convergent to a very narrow slit or fused. Exciple in section black, completely carbonized & very brittle, 20 – 80 μm thick at the sides, 50-100 μm thick at the base, unchanged or very weakly olive in KOH, unchanged or weakly reddish brown in HNO3, consisting of irregular, connate cells, 4.5 – 11.5 μm wide, becoming colourless or pale brown in the upper part & merging into a hypothecium up to c. 55 μm thick. Hymenium colorless, 95 – 150 μm thick, I minus with or without pretreatment in KOH. Asci eight-spored, narrow cylindrical, 85 – 120 μm long, 11 – 15 μm wide, non-amyloid. Paraphyses (paraphysoids) separating easily, serpentine, sparsely branched and anastomosing, 1 – 2 (-2 – 5) μm thick; apices blunt, neither pigmented nor swollen. Ascospores hyaline, lacking a perispores, thin walled, one-septate, noticeably constricted at the septum, sometimes with apices rather pointed: (15-) 16 – 17 x 6 – 7 μm.” Potentially facultatively licheninzed; hyphae in associated with green algal cells on substrate. 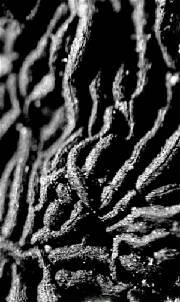 Highly unusual member, it is both terricolous and saxicolous, as well as lignicolous. Collected from Tasmania, and depostied with the CBS and with BPI. Glonium circumserpens (Nyl.) Kantvilas & Coppins. Left: from Kantvilas & Coppins (1997). Photo credits: E.W.A. Boehm (Tasmania; CBS 123343, BPI 878739). Ber. Schweiz. Bot. Ges. 69: 277 (1959). Glonium compactum Kern. From Zogg (1962) pgs. 59, 74.